The current drought across Queensland, New South Wales, Victoria and inner Western Australia has left cattle and crop farmers struggling to keep their farms viable. Farmers and support organisations have said while the current drought is not the worst they have encountered, it is one of the longest and most widespread. 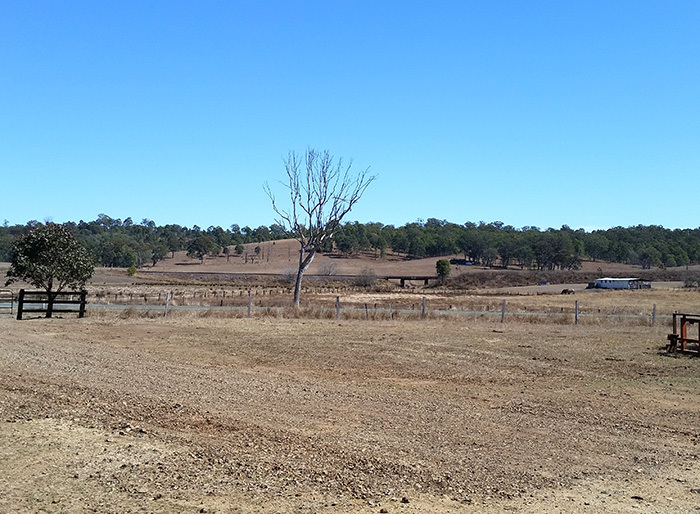 According to information from The Climate Council, by June 2018 only 0.7 per cent of New South Wales was not affected by or recovering from drought. Rural Aid CEO Charles Alder said all of NSW was drought declared while 54 per cent of Queensland was affected by the current drought. Rural Aid is a charity that supports the farming community through different programs, including ‘Buy a Bale’, where people in the community buy bales of hay from Rural Aid for farmers who are struggling. They have volunteers who work on and renovate farms to help keep them viable, as well as providing mental health counselling programs for farmers. Mr Alder said Rural Aid had had to buy more bulk loads of hay bales for their ‘Buy a Bale’ program and said the purchase costs had increased substantially. “The hay is costing us more and more money, it’s almost doubled in price, it’s now $5,000 or $6,000 of hay at a time that we are having to buy,” Mr Alder said. “Usually, we are able to get hay for $50 a bale and now it’s $200 a bale in some places,” he said. Mr Alder said the organisation has taken bales across the country to struggling farmers in various states. “We’ve moved in excess of 400,000 bales of hay in the past five years to multiple points across NSW, Queensland and Victoria,” he said. Mr Alder said each drought’s intensity was different and the difference of this drought compared to the previous was that feed was limited. “The supply they normally have access to is not available and that’s causing greater angst than in previous droughts,” he said. Not only are farmers being affected; rural businesses in country towns are also suffering because they are not getting customers. “It’s becoming harder and harder for those country town businesses to remain viable,” Mr Alder said. “What people need to recognise is that for every year of drought there’s five years of recovery,” he said. Rural Aid Australia has already raised more than $6 million to help farmers in need over the past few months. Seventy-six-year-old farmer Graham Wilson is struggling to feed his cattle in the current drought. Mr Wilson has been farming for most of his life, and has lived on his Tamrookum property in Queensland for 40 years. For the past 15 years he has also owned cattle in rural New South Wales, where he pays someone to feed and care for them. “I would normally go down there [to NSW] and shift 50 to 60 tonne of cattle and [cull] the harvest for 14 weeks,” Mr Wilson said. “I won’t be going down this year because there’s no grain to cull,” he said. Mr Wilson said he had experienced worse droughts than the current one, especially in NSW, with people helping him take cattle to graze on other properties and drovers feeding his cattle on the roads. “About eight years ago, drovers told me I had to shift cattle off the road because there’s no feed and no water, and that’s happening in NSW as we speak,” he said. Mr Wilson said he had never run out of water due to having a river near his property, but said feed supplies had been tight. “Hay is dear and more expensive than I’ve ever seen it,” he said. 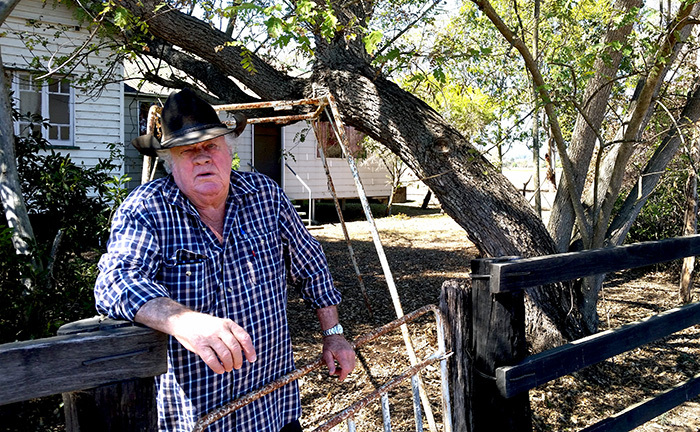 The current drought has seen Mr Wilson have to sell most of his cattle in NSW to pay the bills. “[This drought] is a lot more widespread,” he said. While Mr Wilson has only needed financial help with his farm, he said other farmers affected by the drought have needed help from farmer support organisations. If you want to know more about Rural Aid or how you can help drought affected farmers, visit the Rural Aid website.